For the second time after the successful premiere 2008 in Tirrenia, Italy, the MLB Academies will hold a tournament this week. 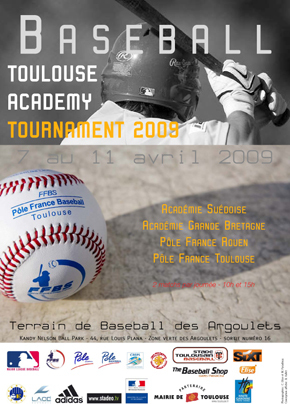 From April 7th to 11th unfortunately only four teams will compete in Toulouse, France. Besides the two French Baseball Academies from Rouen and Toulouse; Great Britain and Sweden also will send squads. After a round robin from Tuesday to Friday, they will play classification games on Saturday.